Architect provides a concentrated, comprehensive list of elements to assist you with expression building. This list includes mathematical, statistical, text, date and time, logical, comparison, list, financial, audio, language, and type cast categories. Each element includes a description, implementation code, return values, and parameters. You can also view examples of specific strings and the resulting output. Within the Expression Help, you can copy and paste a desired example into the Edit Expression dialog box and then modify it to meet your expression calculation. In the upper right corner of Architect, click the Help button and select Expression Help. From the Edit Expression dialog box or the Edit Audio Sequence dialog box, click the F() button. The Expression Help dialog box opens. Click the X in the upper right corner to exit the Expression Help dialog box. Within each Implementations section, the Expression Help includes a Parameters section that provides helpful information for flow authors, such as whether the parameter is allowed to be NOT_SET at run-time, minimum and maximum values, and other restrictions. For example, when a parameter is only allowed as a literal. 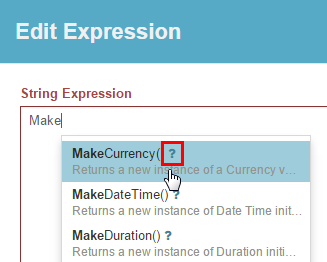 By including “USD” in the following expression, the author ensures that the currency code parameter is a valid ISO 4217 code, as specified in the MakeCurrency parameters. When Architect validates this literal value at design time, it returns a message informing the flow author that the literal “USD123” supplied to the currencyCode parameter is not a supported ISO4217 currency code.